With Game 5 rapidly approaching, manager John Farrell has a difficult decision to make. The Red Sox outfield has been in turmoil the entire World Series with the only player starting every game being Jacoby Ellsbury. Ellsbury will not factor into who should start tonight, we will give him the start out in center field. This leaves Jonny Gomes, Shane Victorino and Daniel Nava all fighting over two spots. For the sake of an argument lets say that Victorino is healthy enough to play tonight. 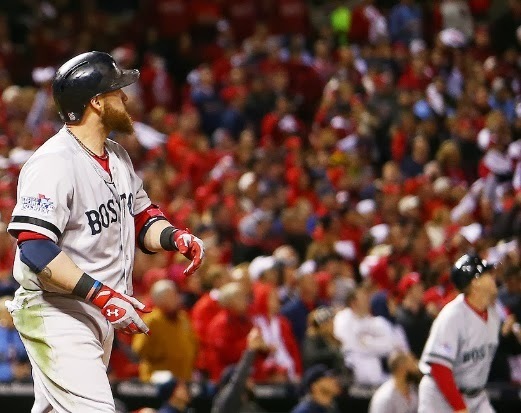 Gomes has been the hottest at the plate out of all these options, hitting the game winning 3 run home run last night in Game 4, but here he succeeds at the plate, he lacks in the outfield. Gomes is slightly slower than Nava and much slower than Victornio. I think it is very hard to sit Gomes tonight, due to his performance last night. Victorino has been awful offensively this World Series, going 0-10. This is simply not an acceptable performance for the #2 guy in the lineup. His production has to be much better than it has been so far. Yet while he is not performing at the plate he is outstanding in Right Field. Being in Busch Stadium, a much larger outfield than Fenway Park, Victorino's speed is needed out there. If Victorino is able to play tonight his injured back may slow him down. I would have to take a long hard look at Victorino when he is warming up to see if I would start him. Nava is 2-10 this World Series. He got the start over Gomes last night in Left Field but was moved to Right Field due to Gomes eventually started due to the Victorino injury. Last night Nava went 0-4 at the plate in the 2 spot, the place that Victorino typically is. Nava is faster than Gomes in the field but slower than Victorino. Nava in my mind would get the start over Gomes, but not over Victorino due to his speed. So, who will Farrell go with? Its quite the tough decision, personally I would start Daniel Nava in Right Field and Jonny Gomes in Left Field. It worked last night, why fix something that isn't broken? Gomes provides a spark to the offense that neither of the other outfielders have currently. What do you think? What duo should start tonight's pivotal Game 5 in St. Louis? Leave your answer in the comments section below or let me know what you think on twitter.